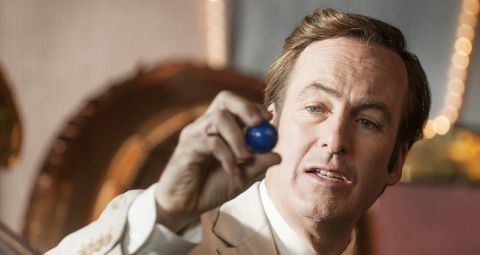 All season we’ve been waiting to see when Jimmy McGill will reach the personal crossroads that leads down the road to becoming Saul Goodman, but in this season finale he arrives at it via an unexpectedly circuitous route. It’s an enjoyable journey, mind. It’s good fun seeing Jimmy heading back to Cicero and sliding back into his Slippin’ Jimmy lifestyle. There’s plenty here to enjoy for anyone with a love of classic con-artist movies like The Sting or House Of Games. The montage of scams carried out by Jimmy and wingman Marco – a throwback to old film noirs - is beautifully lit and edited (and, apparently, includes references to numerous real-life scams – co-showrunner Peter Gould did his research). Both Marco and Jimmy hum/grunt the Deep Purple classic “Smoke In The Water”(odd coincidence that, given that Jimmy doesn’t see Marco humming the tune – perhaps he knew it was a favourite of his old friend? ), which then plays as Jimmy drives off into the sunset. Other key tracks are Al Kooper and Stephen Stills’s cover of Donovan’s “Season Of The Witch” (which plays as Jimmy arrives back in Cicero) and jazz instrumental “Banzai Pipeline” by Henry Mancini and his orchestra (soundtrack to the con montage). But it’s an odd finale. Peter Gould has said that Jimmy’s change of path comes as a result of the fact that he’s no longer seeking to win his brother Chuck’s approval. So it’s a little strange not to see that dramatised. Instead it comes across more like it’s inspired by the memory of his old friend from his Slippin’ Jimmy days, Marco (note how Jimmy rubs at the ring Marco bequeathed to him at the moment when he turns away from a respectable law career). One might also have expected more fireworks – or for Tuco’s henchman Nacho to play a part. So while “Marco” is a strong episode, by turns funny and sad, after waiting so long to witness that pivotal moment, it does feel strangely anti-climactic. Jimmy’s bingo rant contains not one but two namechecks that should have Breaking Bad fans nodding in recognition. Firstly, he mentions that Belize is “a beautiful place”. Back in Breaking Bad 5.10, “Buried”, Saul used “sending someone to Belize” as a euphemism for killing them. He also compares the local landscape to something by painter Georgia O'Keeffe – a favourite of Jesse’s girlfriend Jane. Back in Breaking Bad 3.11, “Abiquiu”, Saul claimed, “I once told a woman I was Kevin Costner, and it worked because I believed it”. It sounded like BS, but in this episode we see that it’s true! Jimmy hangs out with his old con-artist wingman Marco for a week and comes to a decision.